Mop up efforts continue in two week wildfire. Two weeks from the start of the La Brea Fire, and after long days of tough firefighting involving over 2,000 firefighters at its peak, it was declared fully contained as of Saturday, August 22 at 6 p.m., as firefighters have completed the last section of fire line within the San Rafael Wilderness. 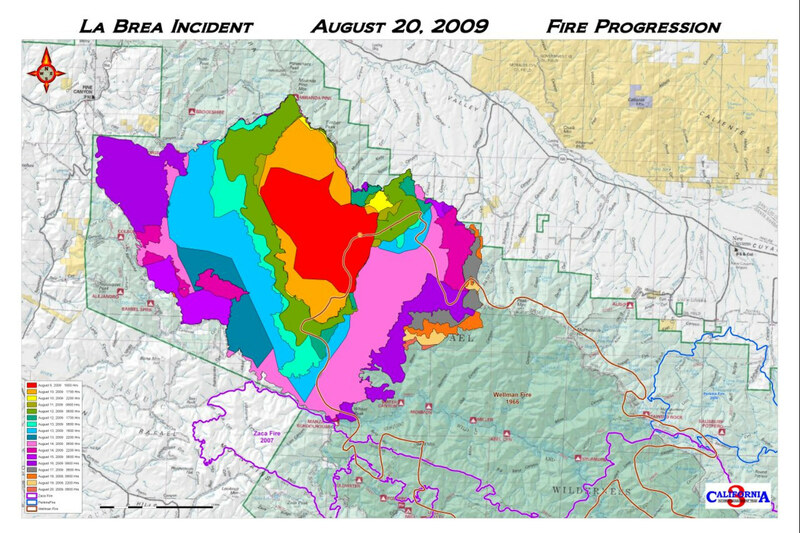 La Brea fire progression map showing where Zaca Fire (2007) burn occurred. (Enlarged to improve readability). The fire, early on, gained nearly 10,000 acres per day, exceeding over 20,000 acres on one mid-week day. As it grew, the strategic plan utilized existing dozer lines built during the Zaca Fire of 2007, existing roads where possible, and as best possible a 2-day lead time before the wildfire would hit the containment lines being built for burnout operations. The fire, located about 23 miles east of Santa Maria, was under the direction of Incident Commander Jeanne Pincha-Tulley, who leads California Interagency Incident Management Team 3, and unified command with CALFIRE and Santa Barbara County Fire. Additionally, implementing and lifting evacuations required coordination of the team and the Santa Barbara County Sheriff’s Office. Resources working the fire included engines, hand crews, ‘dozers, aircraft, and water tenders. The initial priority was to protect private property and homes, allowing the fire burning deep in the San Rafael Wilderness to burn unattended until the other fire flanks were contained. Once private property areas were secure, and with the fire stalling in the wilderness, the decision was to take a direct attack approach using hotshot crews, supported by heavy lift helicopters making water drops, and heavy air tankers dropping retardant when needed. Approval to use motorized and mechanized equipment in the wilderness was obtained so chainsaws and helicopter landing spots could be employed. If that attack failed, and with limited solid defensible ridges to the southeast, the potential was for the fire to run to the Zaca Fire. Firefighters completed the last two miles of open fire line in extremely steep terrain. That terrain has been the factor for the cautious pace of the last few days. Firefighter safety is the highest priority and no unnecessary risks are taken. As the major suppression operation is downsizing, surplus equipment and personnel are being released from the incident to their home units, some as far away as Pennsylvania. Suppression line rehabilitation using fire crews, ‘dozers, and track hoe excavators is progressing with water bar construction, road culvert cleaning, and scattering vegetation on back-up fire lines that were built as a contingency, or on fire line sections where the fire is clearly out. Water bars are small berms built across the slopes to slow water and reduce erosion when the rains return. Current Situation: Starting Monday, August 24, the fire will be managed by the Central Coast Interagency Incident Management Team 7, under Incident Commander Jim Smith. Over the next several days, firefighters will continue to mop up 500 feet inside the firelines and rehabilitate the suppression lines. Although likely to decrease each day, some interior smoke and flare-ups are to be expected, consuming islands of unburned fuel mostly well inside the burned area. They do not pose any serious threat of crossing the containment lines and firefighters monitor these interior flare-ups, usually not taking any suppression action since it is not needed. Suppression line rehabilitation using fire crews, dozers and track hoe excavators is progressing with water bar construction, road culvert cleaning, and scattering vegetation on back-up firelines that were built as a contingency, or on fireline sections where the fire is clearly out. Water bars are small berms built across the slopes to slow water and reduce erosion when the rains return. Weather: The fire received little rain late Saturday afternoon, which only slightly moistened the fire area. Some crews were moved from the fire due to a concern for the development of muddy and slippery roads. 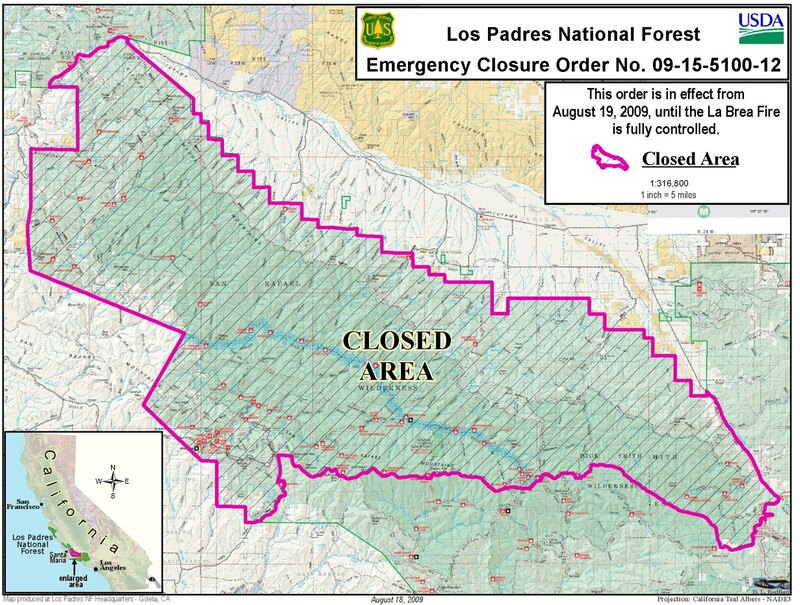 Closures: An emergency closure order remains in effect for portions of the Los Padres National Forest in and around the burned area, that includes a total of 405,300 acres. For more information, please contact Fire Information at (805) 961-5770 from 6am-10pm. The last evacuation warning has been lifted by the Santa Barbara County Sheriff’s Office. U.S. Forest Service Special Agents, the Santa Barbara County Sheriff’s Office and fire investigators determined the La Brea Fire was caused by a cooking fire at an illegal marijuana drug trafficking operation within the forest. The La Brea Fire Tip Line is still open, and anyone with additional information helpful to this ongoing investigation is urged to contact 805-686-5074. Due to emergency vehicle traffic and congestion on Highway 166, the public is urged to use extra caution when traveling the highway. The Manzana School House has survived another fire. Standing on the bench above the confluence of Manzana Creek and the Sisquoc River, the Manzana school house brings to mind images of turn of the century life and homesteading. Constructed in 1893, the schoolhouse served a community of about 200 people, living on 20 homesteads near the confluence. Los Angeles precipitation records suggest that five of the seven years from 1894 to 1900 were dry in Southern California. This drought followed a relatively wet 15 year period and would have resulted in a dramatic change in water resources. Farms failed as the drought persisted, and in 1902 the school closed. The Schoolhouse is a Santa Barbara County Historic Landmark. La Brea Fire officials were considering using a fire retardant wrap to protect the old wooden structure but structure protection efforts by firefighters kept the popular site from going up in flames. 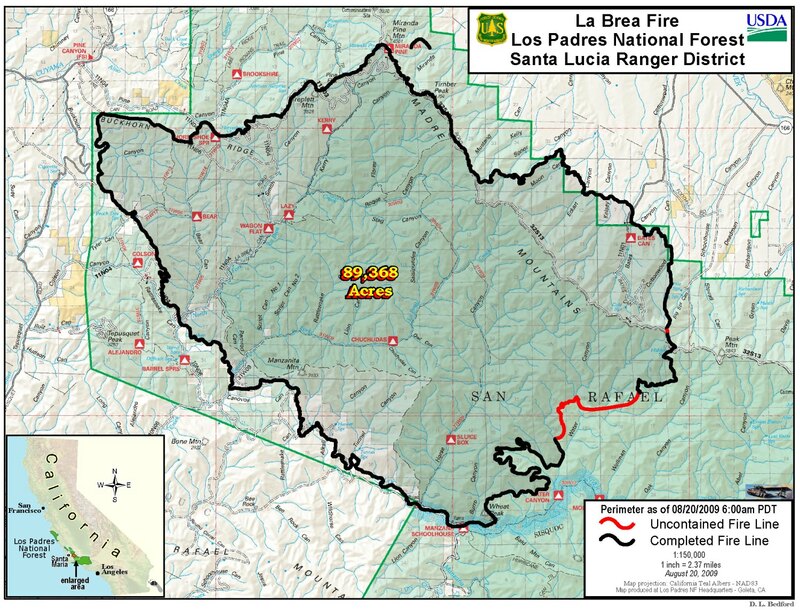 Management of the La Brea Fire will transfer to Central Coast Interagency Incident Management Team 7 0n 8/24/09 at 6:00 a.m. The goal of interagency management teams is to provide professional incident management public service through flexible planning, decisive implementation, professional execution and constant assessment of actions taken. Cause: Fire was started by a cooking fire at a marijuana drug trafficking operation. Fuels Involved: Primarily Chaparral with areas of grass and timber. Fire Behavior: There was very little fire activity over most of the fire yesterday due to successful fire suppression activities and scattered showers over the fire. Significant Events: Crews continue continued to monitor, patrol, mop-up and work on suppression rehabilitation. Planned Actions: Resources will continue to monitor, patrol, mop-up and suppression rehabilitation. Remarks: Command of the La Brea Fire will transition to Smith’s Type II Team on 8/24/09 at 6:00 a.m.